Token (SMF) power-type metal film molded resistors provide three power, 2W, 3W, and 5W. Resistance range of 10Ω ~ 2MΩ, and the maximum working voltage up to 500V. 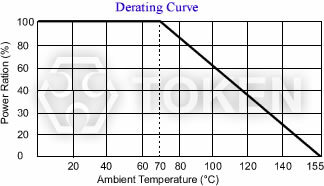 The tolerance accuracy has two options ±1% (F), and ±5% (J) with temperature coefficient of ±100ppm/°C. Power wirewound Chip Resistor (SMW) series includes 2W, 3W and 5W three kinds of power. Resistance range from 0.1Ω to 680Ω and accuracy tolerance options are 1%, and 5% with low TCR and high overload capacity, suitable for surge and pulse applications. Token non-magnetic SMD resistor (HM) series, applied to the field of medical high magnetic fields, such as electronic circuits located in magnetic resonance (MRI) and computed tomography (CT), or in the extreme environment of oil and gas industries, such as downhole instruments for oil wells, or flight control in aerospace applications. AR Series ideal for high-accuracy designs where board space is limited. Features thin film TaN & Ni/Cr resistor, TCR from ±5PPM ~ ±50PPM, and tolerance from ±0.01% ~ ±1%. Token's AR series of Nichrome thin-film chip precision resistor is ideal for a wide range of applications requiring excellent stability, tight tolerances, and low TCR, including circuitry for navigation and avionics instrumentation, medical equipment, test equipment, automotive instrumentation, and telecommunications systems. PR Series features special passivated NiCr film for Anti-Acid and Anti-Damp, very tight tolerance from ±0.1%, and extremely low TCR from ±25PPM/°C. Token manufactures thin film chip precision anti-corrosive resistors complying Lead-Free Logo, lead-free products, and lead-free soldering. Thin film resistors terminator (BUSSED) networks, thin-film resistors meets restriction of hazardous substances RoHS directive and RoHS compliance. New (HVR) High-voltage chip resistors deliver ratings up to 4 KV. Token electronics has introduced a thick-film chip resistor series with wide resistance range from 10Ω to 100MΩ. The (HVR) series of surface mount resistors feature high-voltage operation in standard 0402, 0603, 0805, 1206, 2010 and 2512 package sizes, making them well ideal for automatic handling methods. PWR Series features high power rating, very tight tolerance from ±0.5%~5%, and improved working voltage ratings. thin film Chip pulse withstanding resistor can be customed designs and tighter tolerances available on request. Application of thin film chip resistors specific designs also available including different thin chip size and ppm specifications adjusted to resistance requirements. FCR Series features compact size and light weight, excellent high resistance and weather resistance, and suitable for both flow and reflow solderings. The thick film resistor flip chip configurations (FCR Series) are available in industry standard EIA0603, EIA0805, and EIA1206. RCA Series is more advancement in mounting density than individual chip resistors. Integrated 8 elements for Pull-up/Pull-down. Easy soldering fillet inspection. Its small 1.6mm by 3.2mm package enables the design of high-density circuits. The resistor chip array (RCA Series) offers a low cost when compared to using four high-precision resistors. RCN chip network resistor is excellent in stability and electrical characteristics with relative low TCR. Those no-lead packages are optimized to meet new automotive industry requirements for temperature and humidity, while offering high repeatability and stable performance for industrial, telecommunication, and consumer electronics. Token electronics AEC-Q200 current sensing resistor (LREA) offer excellent stability, high power, small size, excellent heat dissipation and high solder-joint reliability which make them excellent for design into Electric Vehicles, Hybrid Electric Vehicles, Automatic and Continuously Variable Transmission systems and other vehicle power applications. Token (LRE) series enable a wide range of design options and flexibility allows designers to specify the resistance value and tolerance that their circuits require, instead of designing their circuits to the resistance values available. At the same time, Token electronics also offers AEC-Q200 Automotive Grade (LREA) specifications by extending (LRE) series for vehicle applications. Token extends its surface-mount current sensing series with (LRF). This 4-terminal connection Kelvin chip resistor derivative in 1/2 watt and 1 watt package sizes. TCR down to 150ppm and enables tight tolerances down to 1% for increased measurement accuracy. Token LRF0612 combines tight tolerance and low TCR with extremely low resistance values down to 0.5mΩ in the compact 0612 case size. Five jumpers for the different resistor chip sizes are provided a wide range of standard dimensions 1206, 2512, 2817, 2725, and 4527 to make ease of designs along with footprint template compatibility. These true metal alloy strip zero ohm chips (LRJ) make options with a lot less space and cost than DIP switches and jumper headers. Providing design engineers with an economical low ohmic value, current sense metal strip chip resistor with high quality performance, Token Electronics LRC Series is suitable for applications in the automotive sector for applications that require high power handling (Up to 3W) and low resistance 0.5mΩ. Designed for current detecting in power electronic systems, the fully RoHS compliant CS series is suitable for a range of applications including the monitoring of power usage and battery life; and provision of output protection for power supplies; as well as for a range of consumer and automotive products such as satellite navigation, handheld PDAs and digital set-top boxes. The trend towards smaller handheld and portable electronics equipment has also increased the need for ultra small current sensing thin film resistors. Devices from the Token Electronics' TCS series use a thin film construction that enables them to achieve precision resistance tolerances, low noise and long-term stability. (LRP) is aiming for very high power-to-footprint size ratio, excellent frequency response and very low inductance in a solid metal nickel-chrome or manganese-copper allow resistive element with low resistance values from 7mΩ to 100mΩ. (LRM) Design for applications that require a wide range power handling from 1/8W up to 3W and low resistance values from 1mΩ to 100mΩ and come with a range of advantages including a wide temperature range and a varied choice of wide range package sizes 0805, 1206, 2010, and 2512. For applications required pulse withstanding, working voltage ratings (power wattage) is one of key factors. For applications required stability and precision, look for Token's Electrical Specifications for TCR and Resistance Tolerance parameters. Whether you’re designing circuit for telecommunications, computers, consumer electronics or office equipment, Token has the right chips for your application. The Temperature Coefficient of Resistance (TCR) is expressed as the change in resistance in ppm (0.0001%) with each degree of change in temperature Celsius (°C). For example, a resistor with a TCR of +100 ppm/°C will change +0.1% total over a 10-degree change and +1% total over a 100-degree change. In the context of a resistor network, this TCR value is called the absolute TCR in that it defines the TRC of a specific resistor element. High voltage resistors often are potted or operated in oil as the arc over voltage, in air, is approximately 10,000 volts per inch. Token’s resistors feature higher voltage ratings due to their high square count and associated design characteristics. Download Surface Mount Terminology & Glossary in PDF file. The sensitivity level of resistors used in electronic equipment to an electrostatic discharge (ESD) varies from a few hundred volts to a few tens of kilovolts. Ways to make resistors more robust to ESD are suggested. The most popular electronic assembly method today is the surface mount technology, SMT. Manufacturers of components responded to this trend by developing standard sizes of surface mounted chips. Miniaturization leads to the use of smaller sized SMT chips and this causes an increase in the sensitivity of electronic equipment to ESD. ESD voltage levels which do not affect larger resistor chips may be dangerous for smaller sizes because of their smaller heat capacity. Therefore, resistance value by ESD characteristic tends to become large following on becoming small. Moreover, it is influenced by conductive mechanism of resistive material, resistance value trends to be influenced with the range from 100 Ω to 100k Ω, and the ESD characteristic is hard to be influenced by ESD in the domain where resistance value is lower than that range or a high domain. The principal difference between thick film and thin film resistors is not the actual thickness of the film, but rather how the film is applied to the chip substrate surface (SMD resistors) or the cylinder (axial resistors). Thick Film Resistor is manufactured by screen-printed a much thicker conductive paste of Ceramic and Metal, called Cermet, onto an alumina ceramic substrate. This composite of glass and conductive ceramic (cermet) material is then baked in an oven at about 850 °C to form the film. Thin film resistor has better TCR and tighter tolerance than thick film due to sputtering technology precision timing control while thick film resistor has better pulse withstanding ability than thin film because of the thickness of film. Power ratings are based on physical size, allowable change in resistance over life, thermal conductivity of materials, insulating and resistive materials, and ambient operating conditions. For best results, employ the largest physical size resistors at the less than their maximum rated temperature and power. Never use them continuously at their maximum rating unless you are prepared to accept the maximum allowed life cycle changes. If the circuit designs permits, the choice of a high ohmic value resistor or divider network will minimize the power level and improve the resistor’s performance as it is operating at a lower power level. Rated power is the maximum value of power (watts), which can be continuously applied to a resistor at a rated ambient temperature. The basic mathematical relationship is Equation: Power (Watts) = (Current (Amps))2 × Resistance (Ohm). If the circuit designs permits, the choice of a high ohmic value resistor or divider network will minimize the power level and improve the resistor’s performance because it is operating at a lower power and temperature level. The maximum voltage applied continuously to a resistor or a resistor element. The maximum value of the applicable voltage is the rated voltage at the critical resistance value or lower. If the circuit designs permits, the choice of a high ohmic value resistor or divider network will improve the resistor’s performance because it will operate at lower power. When soldering with a soldering iron, never touch the body of chip resistor with the tip of the soldering iron. Take measures against mechanical stress during and after mounting of Chips, so as not to damage their electrodes and protective coatings. If a transient load like a pulse is expected to be applied, check and evaluate the operations of the resistors before use. Do not apply shock to the resistors or pinch them with a hard tool (e.g. pliers and tweezers). Download Surface Mount Component Application Notes in PDF file. These products are not intended for use in the following special conditions. Before using the products, carefully check the effects on their quality and performance, and determine whether or not they can be used. The performance of these products including the solderability is guaranteed, provided that they remain packed as they were when delivered and stored at a temperature of 5°C to 35°C and a relative humidity of 45% to 85%. Token electronics provides the industry’s most comprehensive range of precision thin film technologies for discrete, network, and integrated passive components used in instrumentation; automotive electronics; communications systems; and portable electronics applications. Ultra-reliable precision Nichrome resistive elements are available on ceramic or silicon substrates in a wide variety of surface mount resistors. In response to market demands for increased precision and stability, Token has expanded range of nichrome thin-film chip resistors. Offering solutions to precision test and measurement and voltage regulation across industrial, military and medical monitoring equipment markets designed to offer superior humidity performance. Token electronics has developed an extensive range of thick film / thin film resistive technologies for electronic circuits in power supplies; test and measurement; industrial electronics; telecommunications; audio circuits; automotive control systems; lighting controls; medical electronics; industrial equipment; and control systems applications. In addition to this, Proven thick film technologies from Token electronics provide a large range of standard resistive low ohmic current sense products for critical battery management, and line termination. The enhanced performance of the chips is made possible by the precise use of the best resistance inks and a closely controlled production process. Today’s electronic devices are becoming smaller and smaller. As a result, designers are moving more towards surface mount components not only for new designs but also to design out large axial and other through-hole resistors. In most cases this is a straight forward task as several resistor manufacturers offer chip resistors with performances to match axial parts. However in some cases, due to power rating or pulse withstanding requirements, this has been impossible. The requirement, in particular, for pulse withstand capability is growing due to the need to protect sensitive modern electronic systems. To meet this demand Token electronics have designed a Pulse Withstanding Chip Resistor (PWR Series). Download General Info. of Chip Resistor in PDF file. Download Token Product Catalogue - Surface Mount Resistors in PDF file (1.38MB).